"Hurry up and wait", or "it never rains, but it pours"
It is not often that one can gaze into the golden rays of heaven. But on two successive morns, The spirits of Antarctica gave us a spectacular light show, the likes I have never seen. We, on the midnight to noon shift, have been denied the opportunity of seeing the sunsets. However, the constellation prize is being able to wait and watch the sunrise. As a city-ite, I am not often awake to see the sunrise, and even if I was, the goliath steel and glass towers that make up my city would almost most definitely deny me being able to see them. On this expedition, I have grown accustom to the uniqueness of watching the sunrise. Unlike the sunset, the rising of the sun commences the beginning of the day, not the end. It also starts with only small echos of what the day will be like. The sunset starts with the sun dropping below the horizon and in many ways is often thought of as the highlight of the event. With the sunrise though, the lights slowly builds up with the climax being the explosion of the sun rising above the horizon. These two morns, all the conditions were right. High cirrus clouds just about the horizon and stretching back behind us, the sunrise occurring over the continent and icebergs dotting the horizon all around the area of increasingly brightening colors in the southeast. The sky started to light up with every color of the rainbow, bold red and oranges and then fiery yellows first lighting up the clouds and then sky. It seemed like the sun painted it golden colors on the wispy swirls of clouds that looks like Mother Nature herself took a paint brush and brush stroked them onto the sky. The sea seem to become jealous of the sky’s colors as if the sky was like a proud peacock showing off all of her colors and so the sea began to pick up the colors of the sky, creating a visual spectacle in every direction. Although clear to the horizon the mist that rises off the waves gave the air a moist feel to it like if we were in the tropics that let the full colors of the sunrise be sent all across the horizon. Finally the clouds and sky were so bright that they seem to be ablaze. However, the sun takes a long time to rise and set here in the polar latitudes. Like a proud queen, she has a royal precession of blazing colors that precede her. 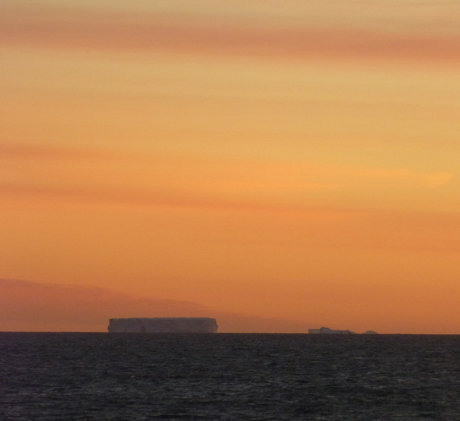 Then far in the distance, we can see her golden rays begin to bathe the very top of the Antarctic ice sheet, probably thousands of feet above sea level. We then knew that she had almost arrived. Then in a final explosion of light, her brilliance pierces the sky and another day on the sea off the coast of Antarctica has begun.